Three convenient locations – enjoy a meal or snack while you're at the hospital. 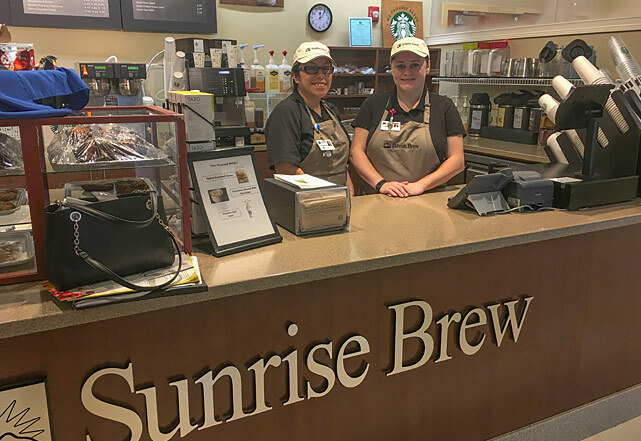 Marshall Medical offers a cafeteria at each hospital location, along with the Sunrise Brew Cafe at Marshall South serving Starbucks® beverages. Location: Enter from the main lobby, across from the welcome desk. Breakfast 6:30 a.m. to 10 a.m. Lunch 11a.m. to 1:30 p.m. Location: From the main from lobby, directional signage will lead you to the cafeteria in the southwest section of the hospital. Monday-Thursday 6:15 a.m. to 6 p.m.
Friday-Sunday 6:15 a.m. to 1:30 p.m.
Sunrise Brew Cafe proudly serves Starbucks® beverages and a selection of both sweet and savory food items. Location: In the Women’s Center at Marshall South on the north end of the hospital. Visitors may pull into short-term parking in the patient drop-off area to pick up refreshments to go.